This week's guest designer is Lain Ehmann, CEO and co-founder of Ella Publishing Company, an online publisher aimed at creating awesome digital products for memory keepers. Lain is former contributing editor with Simple Scrapbooks magazine and author of two books on scrapbooking, Snippets: Tales from the Lighter Side of Scrapbooking (CKMedia, 2009) and (with co-author Stacy Julian) 20 Simple Secrets of Happy Scrapbookers (Ella Publishing Co., 2009). First, you need to know that I'm a speed scrapper! My mantra is, "If I can't get it done in the length of one "Barney" video, it's not getting done!" Most of my pages take between 30-45 minutes. I am fairly linear and simple, but I try to add a little something unexpected. I love mixing up the linear design with polka dots and scallops, and adding a little bit of whimsy. Think Becky Higgins on laughing gas! It's just something inside me! I've always loved color, words, and text, but never considered myself "artistic." Scrapbooking was a terrific discovery in that it allowed me to combine my love of color, words, and storytelling, all together – and it doesn't matter that I can't draw a straight line! I used to be so obsessed with the "famous" designers, wanting to create in the same way they did. But after 12 years of scrapbooking, I think I've finally found my "voice." I still admire other scrapbookers (Sara Winnick, Margaret Scarbrough, Beth Proudfoot, Jody Wenke, Cheryl Overton, Celeste Smith, Emilie Ahern, and Paula Gilarde are some faves), but I don't beat myself up for not scrapbooking like them! (Note: Many of those scrapbookers can be found at http://www.writeclickscrapbook.com/). I love orange! I also am addicted to neutral backgrounds with brights… aqua, orange, lime green… yum! I start in one of two places – I either feel the urge to create something, so then I'll leaf through magazines or online galleries for something to grab me, and then I'll create a layout based VERY loosely on something I find that sparks my interest. Or I have a story I have to tell, so I find the photo(s) to fit and go from there. (This is a great example of having a story I just HAD to get down. This, to me, is what scrapbooking is all about! )Ami Collofello, Katie Pertiet, and Weeds & Wildflowers. I mainly scrapbook about my kids – the little moments are my favorite, like when I asked my five-year-old to help her sister clean up the kids' snow clothes and she responded, "Mom, I've got my own problems!" Twenty years from now, we'll all know they had birthdays and that we celebrated Christmas and all the holidays, but we won't necessarily remember those little moments. I encourage others to document what matters to them. If they want to be a "birthday" scrapbooker, that's totally fine. If they want to throw out all their supplies and just do photo books, great! Find a way that works for you. The important thing is to DO SOMETHING with your memories and your photos. Don't let them languish on your hard drive (or in your brain). Get them out so others can enjoy them! 1. Permission to scrap the way you want to (every day or once a year). 2. 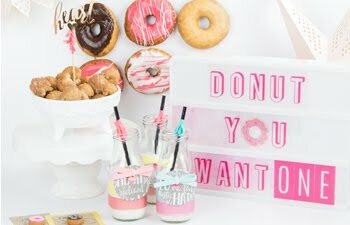 Permission to find your own style or just scraplift whatever you like, whenever you like. 3. Permission to use the products you love RIGHT NOW instead of waiting for a special occasion (which will never come!). 4. Permission to create "less than perfect" pages. 5. Permission to take a break if you need to! First and foremost, scrapbooking should be fun. That means letting go of obligations, "shoulds" and "must haves." Instead, just do it the way you like. Of course, there will be times when you want to learn a new skill or technique, or experiment, or try to become a "better" scrapbooker. But to me, that just means scrapbooking more. Find your groove! Check out what other people do and how they do it. Figure out what grabs you about a layout you see in a magazine or online. Do you like the color combo? The photograph? The journaling? The title? 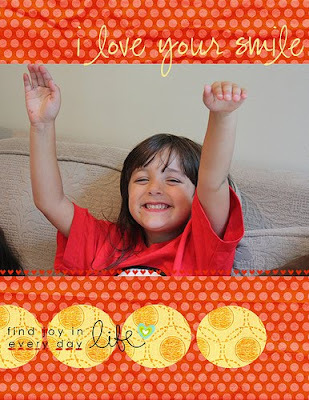 Analyze what you like and why, and then try to bring that into your own scrapbooking! I strongly encourage everyone to take part in my "Layout a Day" challenge in Feb. 2010. We commit to scrapbooking a page a day for the month, and we share our results in a private gallery. You'll get daily emails, support from a team of like-minded crazy scrappers, and meet some of the nicest scrapbookers anywhere! Email me at lainehmann@comcast.net or watch my blog for more details. Follow Lain on her blog, Five Things, on Facebook, on Twitter, Flickr, and at the Write. Click. Scrapbook collective. 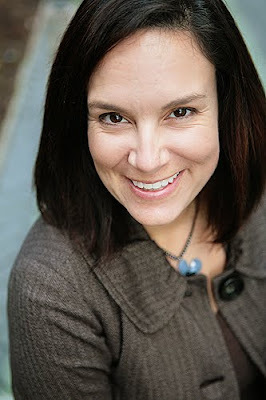 Besides scrapbooking, she adores knitting and reading and her family (three kids, one husband). Lain also just moved from California to Boston and says, "...so expect to see me online a lot this winter." Create Well: DO SOMETHING with your memories and your photos. Don't let them languish on your hard drive (or in your brain). Get them out so others can enjoy them! Isn't Lain fabulous? 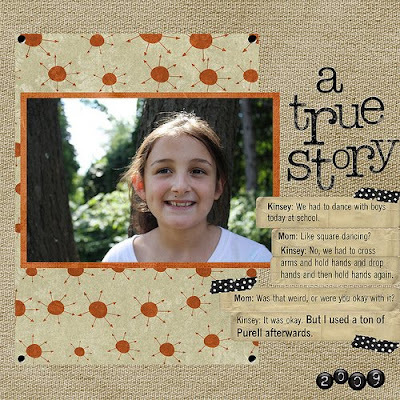 Much of the reason I've stayed scrapbooking is because of Lain and her LOAD challenge. Her attitude of permission to have fun is so engaging and contageous. A real inspiration. She's so talented! I love her style - and even more, I love the spirit: in a way I find her blog, the "5 things", an exact expression of that spirit. 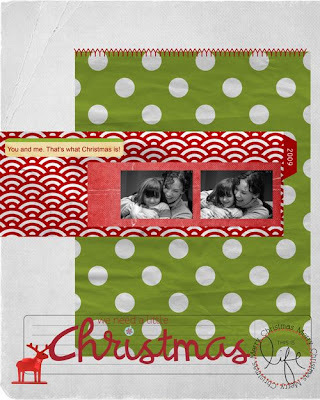 It's fast, straight to the point, no B--T but put together so beautifuly, just like her scrapbooking! Thanks for a great interview! Lain rocks! Her pages are so inspiring! I'm glad I re-found her blog after some time. I used to read her old blog. She's talented and an amazing mother! Go Lain! Thanks for sharing your insight and your creativity with all of us. Thanks for reminding me of why I scrapbook. It has been almost a year since I have scrapped. I take tons of pictures and need to remember your mantra, about completing a layout in a Barney video, maybe I can get some layouts done in 2010 and preserve all those memories sitting on my computer. I love Lain's "permissions"! With all these permissions - I need to go scrapbook right now! Lain is awesome! 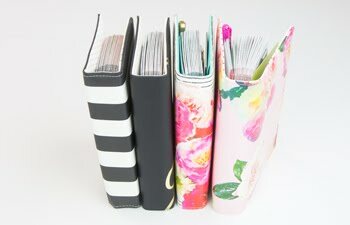 I love the permissions..I have finally have given myself the permissions over the last couple of years to scrapbook the way I want and not being afraid of messing up. Great read! I love all the permissions! Lain=cool! Love her permissions and her style! I luv Lain! She is a great reminder of some basic facts...have FUN!...don't worry about being perfect...find what works best for YOU...it's okay to scrap(steal)lift....and just be yourself. We should all live by those rules. Great reminders of why we scrapbook. Not to agonize over a page, but just to get out the story I'm trying to tell. Thank you so much for this post. It's exactly what I needed to start scrapping again! Welcome to Massachusetts Lain, we need more Republicans. I enjoyed this...especially the permissions! I've been a Lain fan forever. She's one talented lady. And I love her humor! Good stuff! I love the LOAD challenge and will definitely be there again in February! Great advice, Lain! I strongly encourage everyone to take part in LOAD, too! Great fun, inspiration and a whole bunch of layouts accomplished! What more could you ask for? Happy New Year! Great article on Lain. 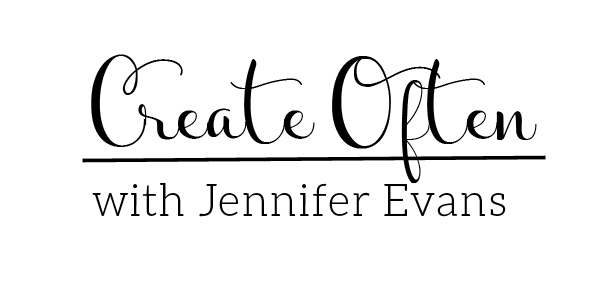 Love her blog and her philosophy on scrappin'! Makes me want to get back to it.....after I sleep! I aspire to be as fast a scrapper as Lain and on some days I actually accomplish it. Can't wait for LOAD Feb 2010! Thanks for featuring Lain on your blog...she's my idol! lol! I'm so glad she mentioned her LOAD (layout a day) challenge. I've participated in every one (has it been 3 or 4? )and I love it! Thanks for the link to this amazing gem. Lain. I will be bookmarking this for sure. I can always use a little more creativity and inspiration and delight. committing to LOAD this year- I love this idea and have always wanted to try it- thanks for sharing some of your processes Lain! Hope to clear out my desk & get ready for LOAD!!!! Very motivational! Love it! LOAD was a great inspiration... Lain made it so fun to participate. Can't wait to do it in 2010!! I also love her blog - so inspirational. Love your 5-things blog. It's a quick lil something that gets me thinking about the topic you've chosen. Layout a day in Feb you say? That sounds very hard... I'm struggling with a layout a week at this point :o) I'll have to check it out and see if you can motivate me! I loved reading your way of telling your stories. I have scrapbooked almost a year. I love it. Last winter I felted knitted purses. This year I've learned this great craft. Thank you for all your great humor and insights. I hope you are settled soon in your new rat free home. So fantastic! Love this article! WOWZA! I am amazed and shocked to be included in a list among such great designers as someone who inpires such a great designer herself! Lain is amazing. Thanks for the shout-out! I love Lain! She's one of the "top finds" on my list for 2009... I know I was a bit late to the party on that, but I am very grateful to have found her.